The Three Rivers Observatory is located in the Sierra Nevada at the entrance to Sequoia National Park in the Town of Three Rivers California. 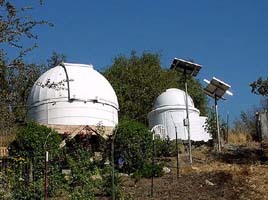 The observatory looks down on the Kaweah river and up at Alta Peak in the Sierras. This 10ft. 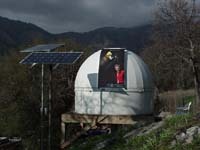 ProDome observatory seems to be one of the few totally Solar powered observatories. It is powered by two 345 amp batteries wired for 12volt operation. The Array provides 16 amps per hour for recharging. For some equipment an inverter is used to convert the 12 volt into 120 sine wave to be able to run three laptop computers and provide 6 volts for operating the 6x 7 Pentax. The inverter provides 750 watts while using only 6 amps. All other equipment operates at 12 volt including the dome turn, shutter and lighting. Ken Fields started dabbling in Astronomy five years ago and immediately gravitated toward photography. Starting with a Meade 416. 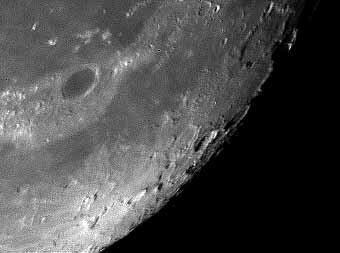 He has been published in Sky and Telescope, The Astrograph and the Meade Catalogue. He also has a number of images posted in various locations on the Internet to advertise products and provide image viewing. He has sold images to Hollywood for use in movies. 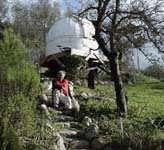 His main enjoyment comes from spending time in the observatory with wife and 8 grandchildren. The observatory grounds feature an arboretum of 250 rare trees including 150 varieties of Japanese Maples and many rare succulents. Garden groups visit frequently, and it provides the opportunity to get the public interested in astronomy as well. Copyright © 2019 Ken Fields. Design and development by Vantage Technology Group, Inc.